In last week’s post, I discussed the benefits of adding a blog to your website. If you haven’t read the article, you can read it here. Get more exposure for you and your practice; publishing a blog increases your authority in the eye of the reader. Bring more traffic to your website; over time more people will find and visit your site, which increases your rankings in the search engines. Now let’s continue the discussion about blogging. Today though, we’ll focus on the challenges that come with blogging. You didn’t think there weren’t any, did you? But before we get deeper into that, let’s revisit the purpose of adding a blog to your business website. Will you be blogging to tell people what you ate for dinner last night, or where your best friend spent her honeymoon? No, of course not! The purpose of adding a blog to your website is to grow your business, right? And once you’re clear about the purpose of your blog, coming up with ideas for content becomes much easier. Remember, people like to do business with people they know, like, and trust. Therefore, what you post to your blog is always geared to help build trust with your readers. So give your readers, your patients, what’s of interest to them. Don’t make the mistake and talk about yourself, your office, or your accomplishments. The flu season is coming up, should I get a shot? How can I lose a few extra pounds? I’ve heard about the new “Peanut Butter Diet,” should I give it a try? I just don’t seem to be able to get a good night’s, what should I do? That’s why you don’t have to write specific, medically detailed posts. You don’t want to go into too much detail because what you write should not be misconstrued as medical advice. You are simply providing general information, not medical advice! 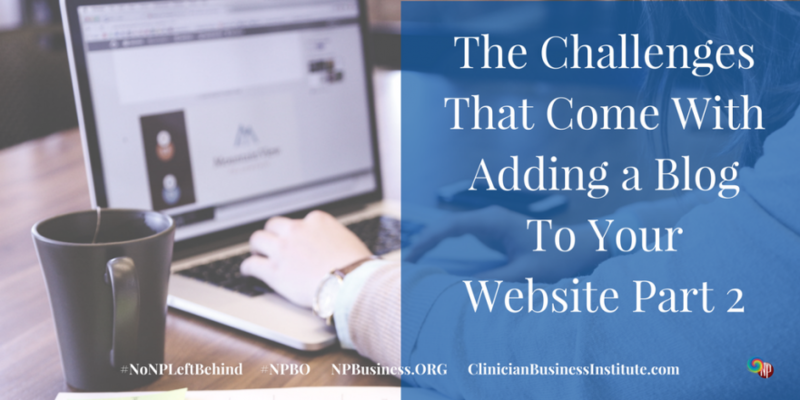 How do you know what’s of interest to your patients and visitors to your blog? Most of us deal with similar challenges and problems; hence we have similar questions. Just listen to the question you hear from patients every day. Chances are you’ll never run out of material to write about. February is American Heart Month: write an article about heart health. April is Alcohol Awareness Month: write an article about alcohol consumption; alternatively, find a video about alcohol. Once you start writing your blog, it’s important you stay consistent. Some people write and publish every day, others write once a week, and some publish once a month. While the frequency of publishing to your blog is up to you, at a minimum, you want to publish once a month, more if possible. But how often you publish to your blog is not nearly as important as publishing on a regular basis. Let’s assume you start out publishing content once a week. Over time, your readers will expect to find fresh content on your site every week. If they come to your site and don’t find anything new, over time, they’ll lose interest and simply stop coming. The lesson here is this: publishing with consistency is far more important than publishing frequently but sporadic. Think about how you want to publish content to your blog. Consider the resources you can draw on. How much time and money (if you hire someone to write for you) are you willing to commit to blogging? I suggest you start posting to your blog with less frequency. Maybe you want to start with one article a month, every third week, or every other week. It’s best to be a bit more conservative until you know this is something you want to do and can commit to doing. Adding a blog to your website not only provides you with the ability to update your site frequently but now you can also do it yourself. Previously, most updates to static sites had to be done by a “webmaster.” The technology used to be much more complicated; it used to take more time and money to update a site with fresh content. Not so today. While you still have the option of letting someone wrestle with the technical side of blogging, you no longer have to. Technology today is so much simpler. And if you go with a platform like WordPress for your blog, updates are as easy to complete as typing a letter in Word or Pages. And really, the tasks are not difficult. However, there is a learning curve; you will have to set aside some time to get the hang of it all. If you’re willing to tackle the learning curve, there are lots of resources available to you. And if you don’t want to do it yourself, there are just as many options available. Either way, what’s important here is that you know what you’re up against so you can make a solid and well-informed decision. So here we are, we’ve come full circle. But “to blog or not to blog,” that is still the question! I hope you now have the information to answer that question. If you have any questions about blogging, let us know. Please share them with us by leaving a comment below.